Whitefox Technologies has announced the successful installation and start-up of its Whitefox ICE system at United Ethanol LLC‘s plant in Milton, Wisconsin. The system will allow the plant to increase its annual production to more than 60 MMgy. Novozymes has released fourth quarter and full year 2018 financial results, reporting strong sales growth for its bioenergy segment. Overall the company’s sales grew by 4 percent organically when compared to 2017. UNICA, the Brazilian sugarcane industry association, has announced mills in the country’s south-central region sold 1.26 billion liters (332.86 million gallons) of ethanol during the first half of January, up 21 percent from the same period of 2018. Construction recently began on a pilot cellulosic biorefinery in Australia. The plant is a collaboration between the University of Newcastle’s Newcastle Institute for Energy and Resources and Ethanol Technologies (Ethtec). Aemetis Inc. recently announced that the U.S. Customs and Immigration Service has issued an I-924 Exemplar Approval for its $50 million EB-5 Phase II funding related to the Aemetis Riverbank cellulosic biorefinery project in California. Gevo Inc. recently made two announcements regarding its efforts to expand the use of sustainable aviation fuel (SAF). The company supplied its fuel to an airport in California and signed on to an existing coalition that aims to expand the use of SAF. 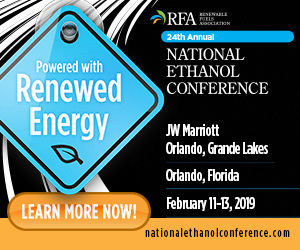 The 2019 season of the Crappie Masters Tournament Trail begins later this week, with the Renewable Fuels Association and the National Corn Growers Association signed on as co-title sponsors for the third consecutive year.